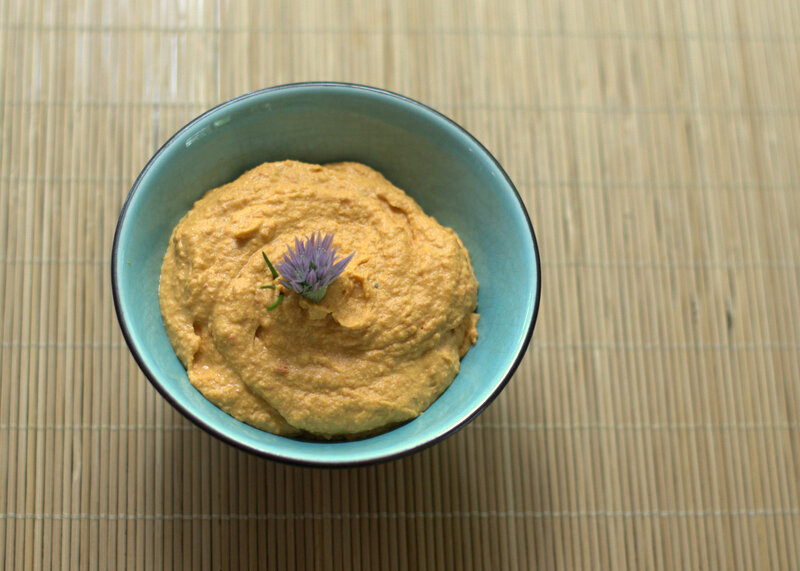 This version is adapted from the brilliant Smooth, Simple Hummus by Inspired Taste. Their secret for extra-creamy texture is in the order and length of time the ingredients are puréed. The tahini and lemon become thick and creamy when puréed on their own for at least 90 seconds. I used the clock/timer on my phone to make sure I let it go long enough. The veggies and spices go in next, and are subjected to another long whirl; I gave them about 2 1/2 minutes total, stopping every now and then to scrape down the sides and check the texture. By the time the chickpeas join the party, the mixture is already light and creamy. They get a few minutes’ processing as well. The result is silky, rich, and surprisingly light in texture. The lemon is prominent; I added a careful few drops of honey to balance the acidity, but it’s not necessary. I tweaked the Inspired Taste duo’s recipe by adding sweet bell peppers and toasted shallots, and used paprika (smoked mild) instead of cumin. Sautéing the shallots and peppers first not only makes the vegetables sweet and caramelized, but flavors the oil that was going in the hummus anyway. You could use a jarred roasted pepper or roast your own, if you prefer. I was planning to sauté the shallots and garlic anyway, so it seemed easiest to just toss the pepper in the pan. I used Aleppo pepper and mild smoked paprika instead of cumin, since they’re in the capsicum family and would enhance the flavor of their bell pepper sisters. I sliced a few carrots on a long diagonal and we used these to scoop up the hummus. We dove in with bagel chips, and even spread it on popovers. Hummus makes a healthy and tasty substitute for mayo on a sandwich. I’ll be playing with this technique again soon. Scallion hummus, anyone? Black olive? Roasted garlic? Warm the olive oil in a skillet over medium-low heat. Add the shallot, bell pepper, garlic, Aleppo (if using) a pinch of salt and a few grinds of pepper. Cook until the shallots are lightly browned and the peppers are tender, about 6-8 minutes. Set the skillet aside to cool. Pour the chickpeas into a colander, rinse well, and set aside to drain. Put the tahini and lemon juice in a food processor fitted with a blade and process for 1 full minute. Scrape down the sides, stir the bottom of the bowl as best you can around the blade, and whirl for an additional 30 seconds. The mixture should be decidedly thicker and very smooth. Using your spatula, scrape every last bit of the pepper mixture and oil into the food processor. Add a scant 1/2 teaspoon salt and the paprika, whirl for 1 full minute, scrape down the sides, and whirl again for 30 seconds. It should be very nearly smooth; whirl for an additional 30 seconds if it’s too chunky. Add half the chickpeas and purée for a full minute. Scrape down the sides, add the remaining chickpeas, and purée for another full minute. Taste and add more salt if necessary; if it’s too sharp, add a few drops of honey (no more than 1/4 teaspoon). If the hummus is still too grainy or thick, add a tablespoon or two of water and whirl for another 30-60 seconds. This entry was posted in appetizers, vegetarian (or easily adapted to) and tagged vegetarian (or adaptable to). Bookmark the permalink.